Location: A hill south of the White Mountains in Morthond Vale; the Stone of Erech lies atop it. 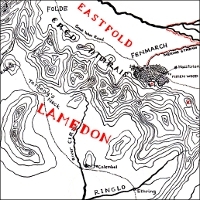 Lamedon and its environs, showing the Hill of Erech in Morthond Vale. And thus, just ere midnight, and in a darkness as black as the caverns in the mountains, they came at last to the Hill of Erech. 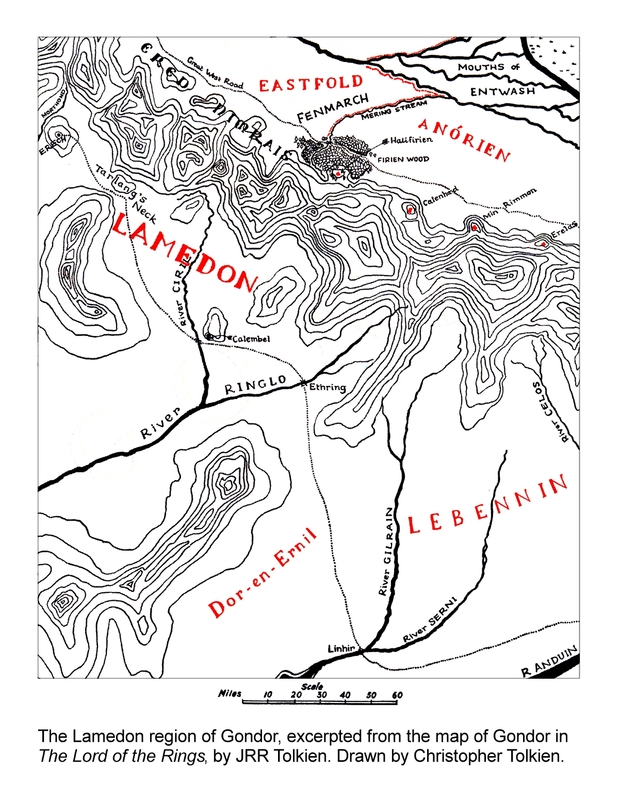 Long had the terror of the Dead lain upon that hill and upon the empty fields about it. For upon the top stood a black stone, round as a great globe, the height of a man, though its half was buried in the ground. Unearthly it looked, as though it had fallen from the sky, as some believed; but those who remembered still the lore of Westernesse told that it had been brought out of the ruin of Númenor and there set by Isildur at his landing. None of the people of the valley dared to approach it, nor would they dwell near; for they said that it was a trysting-place of the Shadow-men, and there they would gather in times of fear, thronging round the Stone and whispering. 1 A league is approximately three miles. 2 This text is from one of Tolkien's early drafts; the name is an earlier version of the proper name as published in The Lord of the Rings.